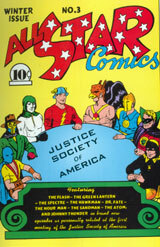 While you may think this landmark assemblage of DC Comics most celebrated Golden Age costumed characters would hold little personal nostalgia for me--I was born thirteen years following it's initial publication, after all--the iconic image of that star-studded group sitting around that table has been deeply ingrained in my memory almost from the first day I began buying my own comics!?! Why? How? Well, as I mentioned in my little discourse on the Spectre's first sixties appearance in SHOWCASE #60, that colorful yet cozy congregation was first viewed by these then 8 year old eyes on a text page included in SHOWCASE #34, which featured the debut of the Silver Age Atom--and was my introduction to that long-running try-out title as well. Oh, there was no logo on the reprinted drawing , but there didn't need to be. Just that magnificently evocative picture would suffice. I had just embarked on my initial investigation into the DC Universe of characters and concepts, and here I was, faced with the breath-taking information that two decades earlier, a whole 'NOTHER group of super-cops were patrolling the pages of publications issued by National Periodicals!?! Whoa! I found the mystery behind that picture deliciously tantalizing. Who WERE these guys? 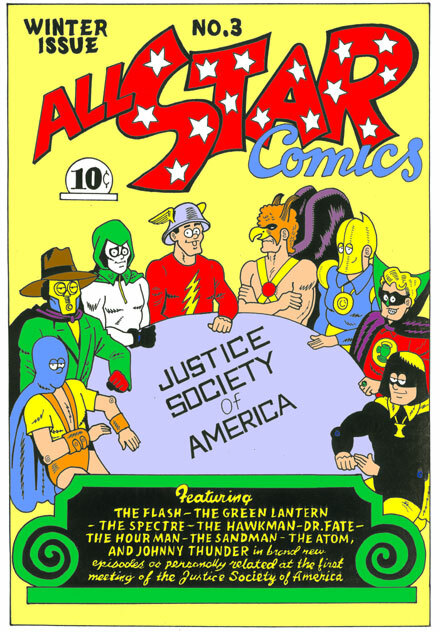 I wondered that for what seemed like forever, until DC, under editor Julie Schwartz's aegis, began slowly bringing them all back in the pages of his various titles, most notably THE FLASH and JUSTICE LEAGUE OF AMERICA. 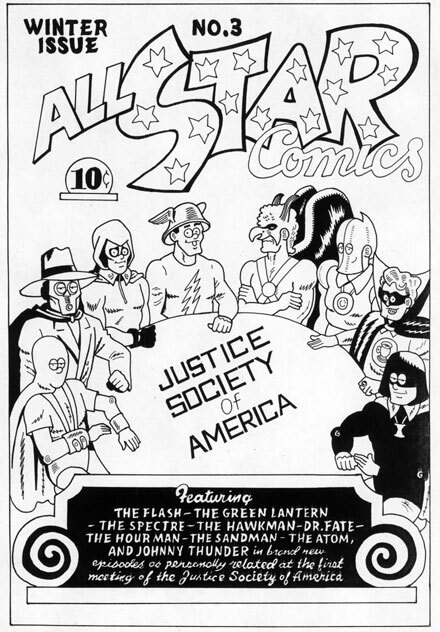 To this day, I have a warm spot in my heart for the Justice Society of America, and I always will. To me, they represent the glory of what went before, some of the most distinguished building blocks upon which this whole crazy comics biz's foundation was anchored. But y'know, as big a fan of the JSA as I profess to be--latter day contingent though it may be--I can easily name one bigger: Roy Thomas. You all know the eminent scribe, Roy Thomas. He was the first man to harness the successful Stan Lee formula in the late sixties and take it to the next level, providing us all with some great stories within the pages of AVENGERS, CAPTAIN MARVEL, HULK, X-MEN, CONAN--virtually the entire Marvel line at one time or another, truth to tell. Although I'd admired his work for years, and glimpsed him speaking on a few panels at comic conventions attended whilst in my fan days, I only ever once shared a billing at a con after I'd made the move up to being a published person. Can you guess just WHEN that was, kiddies? Uh huh--at disaster con, much of which was recounted in painful detail during the previous cogent commentary focusing on AVENGERS #25. Next time never actually came, at least not until now, in a manner of speaking. Through a mutual appreciation of the late, great Bob Hope (Yes! ), Roy and I recently struck up an email conversation. Shortly after celebrating the comedians centennial, Roy came at me with a query: had I ever done an ALL STAR COMICS #3 redo? Seems as if Frank Brunner--noted illustrator of. amongst others, Dr. Strange and Howard the Duck--wanted to write a humorous piece relating to that far-famed issue, and he thought a cover reinterpretation by yours truly would be the perfect thing to accompany it. Well, no, as it turned out, I hadn't, but it had always been my intention to one day whip one up--and THIS was all the impetus I needed! In all my years floating around the edges of the fabulous funnybook arena, I'd never had the privilege of working with Rascally Roy, and as tenuous a definition as that may be for what I'm doing here, I'm surely NOT missing my chance!?! Oh, and just WHERE is this quasi-collaboration scheduled to appear? Why, in Roy's tome, " The All Star Companion, Volume Two", out next year from the fine folks over at TwoMorrows Publishing, of course!! Hey, I TOLD you he was an even bigger Justice Society fan than I was, didn't I? Thanks for the inclusion, Mr.T, and like everyone else, I'll be eagerly looking forward to it's arrival on the nation's bookshelves!